Philip Armstrong recently waxed poetic about the game responsible for selling at least two-thirds of the 60+ million Family Computers and Nintendo Entertainment Systems that found their way into homes around the world in the late 80s and early 90s. My favorite passage: "The game simply makes no sense. View it from a distance and it becomes clear what a strange beast it is. But very few of us were exposed to it from such a removed vantage point. Most of us experienced it from inside first. 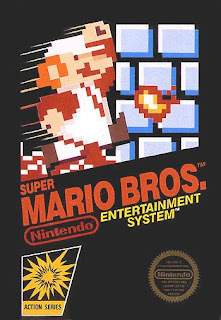 By pushing the start button we became part of the game, and before we ever encountered a giant pipe we ran into that first goomba and lost a life. "The goal was to learn the rules of the game and survive, not to observe the world around us. At least not from a critical viewpoint. A pipe was an obstacle to navigate and a hammer-tossing turtle was an enemy to overcome. It’s not that there was a pipe with a plant growing out of it, it’s that there was a pipe with a plant growing out of it that might kill you." Armstrong's commentary can be found here or in the second issue of Jeremy Perish's GameSpite Quarterly, which focuses on "the greatest games of all time." Some of the titles that appear alongside Super Mario Bros.: Cave Story, Ico, Metal Gear Solid and Tetris.